Join with us in congratulating Rick Tasco for his stunning Arilbred iris "Sand Dancer". 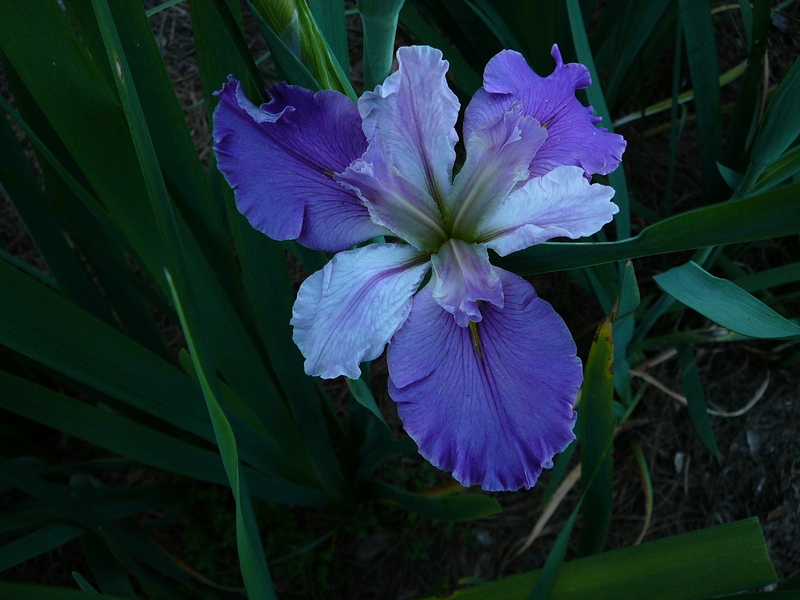 'Sand Dancer' (Richard Tasco 2010) AB 32" Mid-season bloom. Standards creamy tan heavily veined red-brown, occasional purple vein, some red-brown dots near midrib; style arms bronze, purple blush near ridge, some purple splotches on back of crest, underside of crest veined bronze and purple; falls creamy tan ground, heavily veined and dotted red-brown and purple especially in center, lemon shoulder ground; beards dark brown base, tipped golden bronze in throat, bronze yellow in middle and at end; medium purple base foliage. Superstition 2010. HM 2012, AM 2014, The Clarence G. White Medal 2017. Thank you, Rick, for an extraordinary Arilbred iris! For a complete list of the AIS 2017 Award winners, please visit http://wiki.irises.org/. 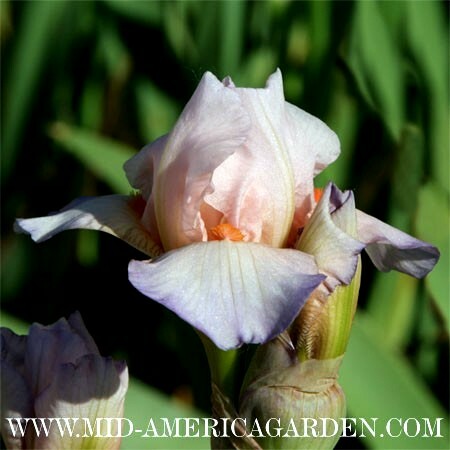 Please join with us in congratulating Michael Sutton as the winner of the 2017 Cook-Douglas Medal for his beautiful "Bright Blue Eyes" standard dwarf bearded iris (SDB). 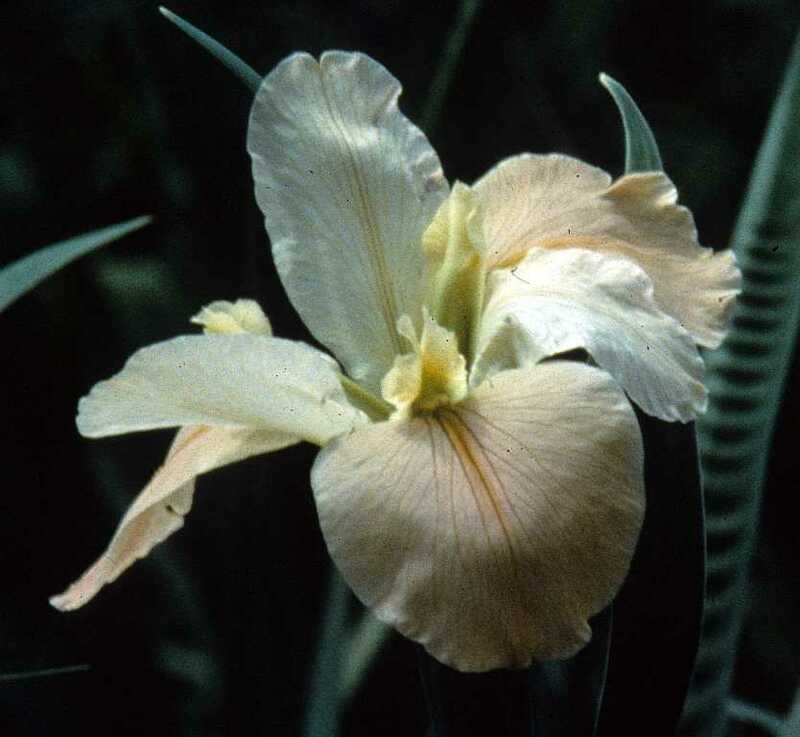 'Bright Blue Eyes' (Michael Sutton, '08) SDB 11" Early bloom and re-bloom, standards cream veined pale yellow; style arms cream; falls white, chartreuse green thumbprint; beards blue; pronounced sweet fragrance. Sutton 2009. HM 2011, AM 2013, Cook-Douglas Medal 2017. 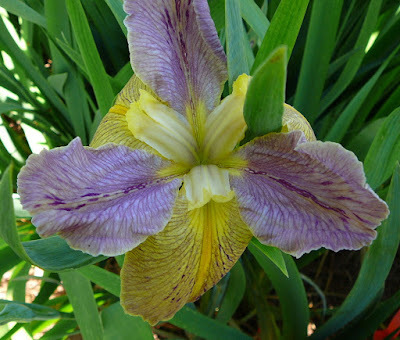 Thank you, Mike, for a stunning standard dwarf bearded beauty! 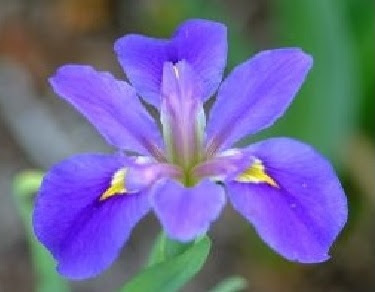 For a complete list of the American Iris Society's 2017 award winners, please visit http://wiki.irises.org/. 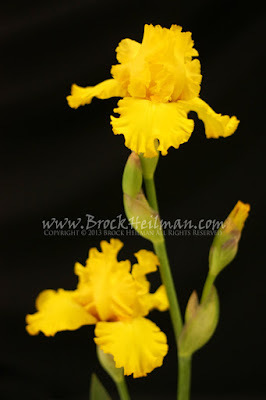 Please join with us in congratulating hybridizer Thomas Johnson as the recipient of The Williamson-White Medal for the outstanding miniature tall bearded iris for 2017 'TIC TAC TOE', a beautifully proportioned dainty bloom. 'Tic Tac Toe' (Thomas Johnson '10) MTB 24" Late mid-season bloom. Standards and style arms pink; falls pearl violet, darker violet rim; beards orange. Tetraploid. Slight fragrance. Mid-America 2010. HM 2012, AM 2014, Williamson-White Medal 2017. Hybridizer notes: strongly flared, shade darker towards the margins. Beautifully proportioned MTB stalks have 2 branches and spur, plus basal branch with spur. Double and sometimes triple sockets produce 10-14 dainty flowers. Vigorous, healthy clumps are a lovely sight. 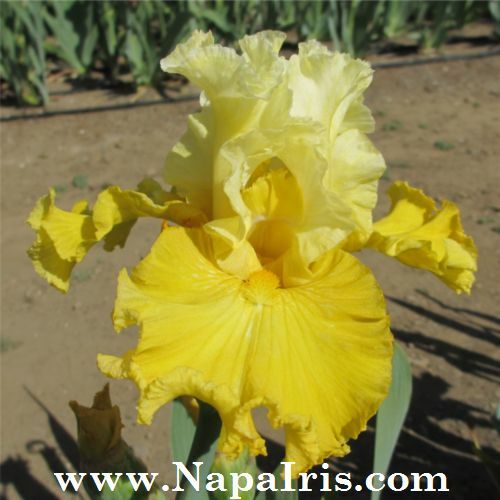 We congratulate Thomas and thank him for another beautiful iris. For a complete list of the AIS 2017 Awards, please visit http://wiki.irises.org/. 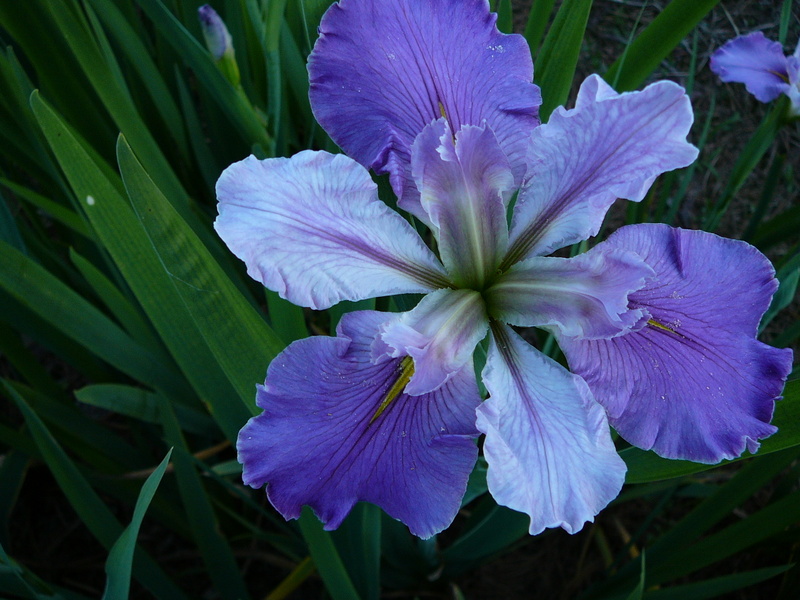 As I wrote in a previous blog “I’m Singing the Blues,” some traditional iris colors have been ignored by hybridizers in recent years. Among those colors ignored are browns—oddly always popular with the carriage trade—and yellow. Ignoring the latter makes little sense. Yellow to gold is such a wonderful color in the garden and brings a shaft of sunlight into plantings even on overcast and dreary days. Here are some yellows and golds to perk up even the dullest day. Abbondanza (Ghio, 2003). 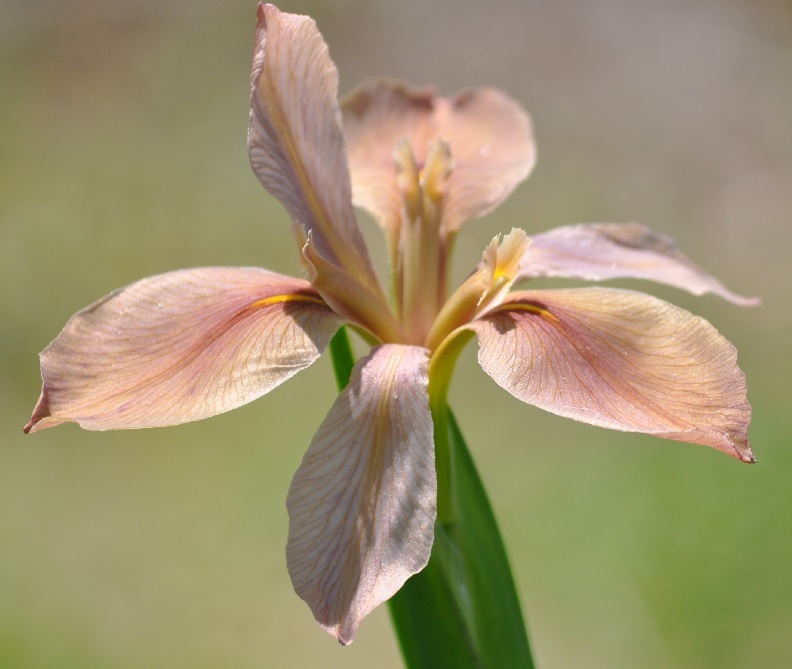 With flowers that bloom from the early season to late, standards are mango gold, infused pink; falls mango gold, heart and shoulders pink; beards tangerine. This is a color that bring yellow and fruit tones together in a warm combination. 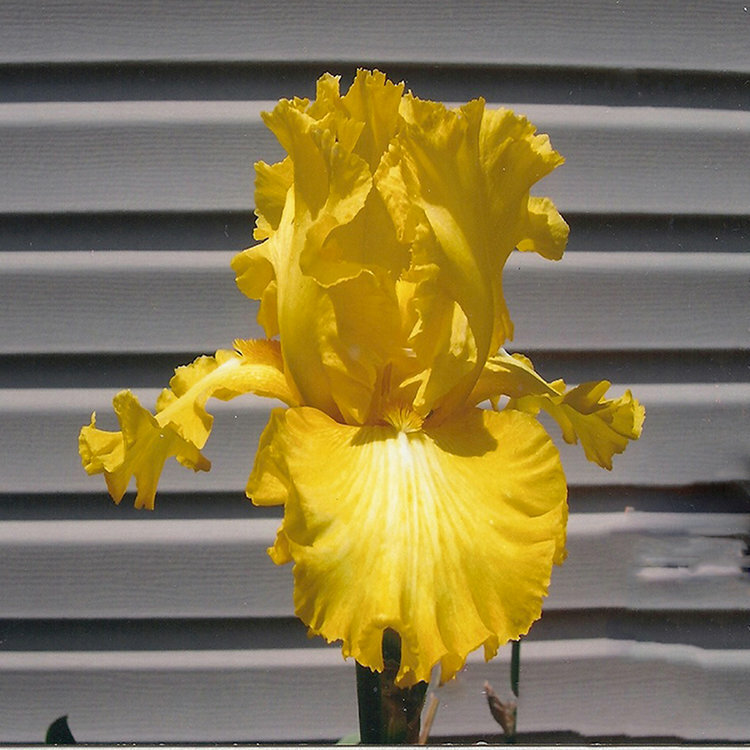 Amarillo Frills (Hager 2002). Not the newest iris on the list, but an early to midseason blooming variety that is a laced yellow self including the beards yellow. 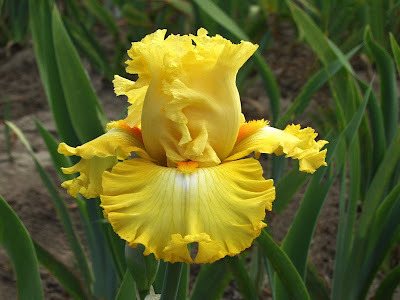 Beauty Becomes Her (Black, 2010) Blooming in the midseason until the end of iris bloom, standards and style arms are medium dark yellow; falls pale yellow blending to medium yellow edge; beards medium yellow, light yellow at end. I have liked this when visiting gardens in Northern California and it grows and blooms well for me. Best and Brightest (Black, 2012). Some greenish hints in the falls of this bright yellow; anyone who is starting a hybridizing program will find this an interesting parent. Better Than Butter (Black, 2010). Yet another of Paul Black’s irises on the list, but this time it is a variety that will expand your season, starting to bloom in the beginning of the iris season and blooming to the end. Here the standards are white with a narrow, bright yellow edge; falls are light to medium yellow darkening towards the edge. A narrow, muted gold band circles the falls. Dance Til Dawn (T. Johnson, R. 2011). 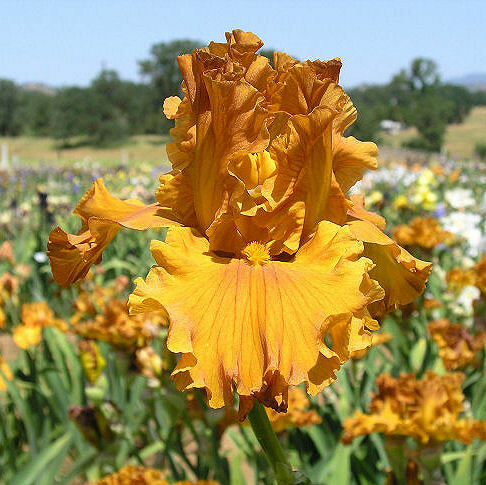 Fifty years ago, one of the major tall bearded hybridizers of that time, Orville Fay, believed that tangerine-red bearded yellows and golds were just around the corner; that goal has been elusive because of genetic linkage. With golden-yellow standards and fall, blazed white, the beards are tangerine to yellow. Fallalary (Johnson, 2010). 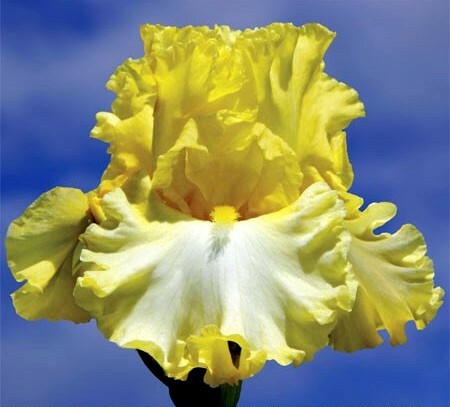 In the tradition of Rainbow Gold, this bright, sunshine yellow has a classic, round form, light ruffling, and heavy lace around the petals’ edges, but the flowers open without problems. Golden Gaga (L. Painter, 2012). This variety takes yellow-gold off into a different direction with blendings of caramel in the standards and falls, darker caramel towards the edges of the petals. Golden Panther (Tasco, 2000). Multi-awarding winning iris. Its awards include an Award of Merit, President’s Cup in 2004 at the AIS National Convention, and the Dykes Medal in 2009. Registered as gold overlaid in bronze, I find that some years it is definitely gold and other years it is bronze. Either way, it is bright and attention getting in the garden. Notta Lemon (Burseen, 2010). Well, actually it is sort of a lemon, though more a lemon-yellow-gold. Starts to bloom early in the season and continues to open flowers until towards the end of the bloom season. Pure and Simple (Maryott by Ghio, 2004). 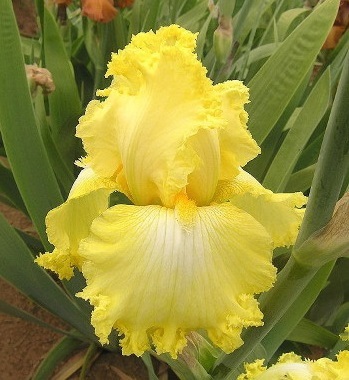 I like this quiet, soft yellow better than its more famous sister seedling That’s All Folks. 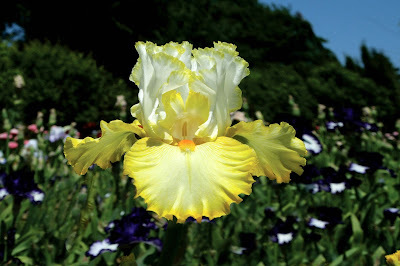 The falls are cream white with a wide band of soft-yellow, the color of the standards. This one always grows well for me and was a standout in the five years of severe drought here. Pure As Gold (Maryott, R. 1993). 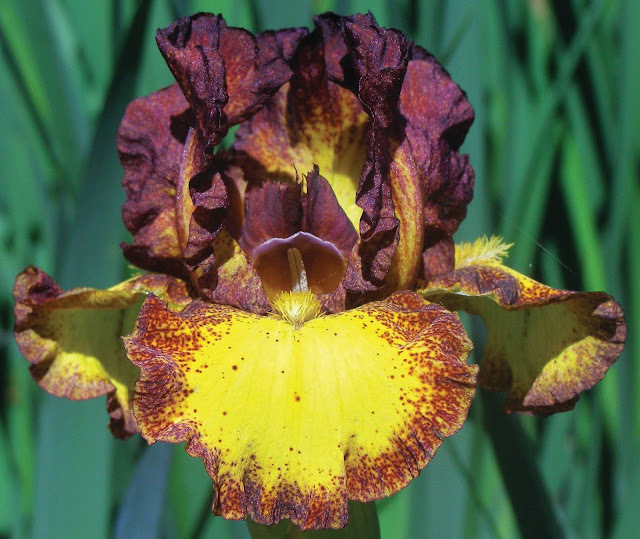 Some may ask why this 24 year old iris is on this list. 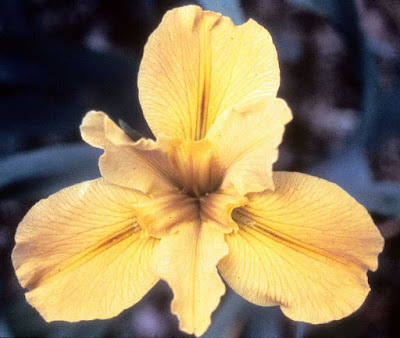 First it is here because of the deep, smooth gold color; the second reason is that it can rebloom in much of the United States. Some consider this to be Bill Maryott’s best introduction. Smart Money (Ghio, 2010). 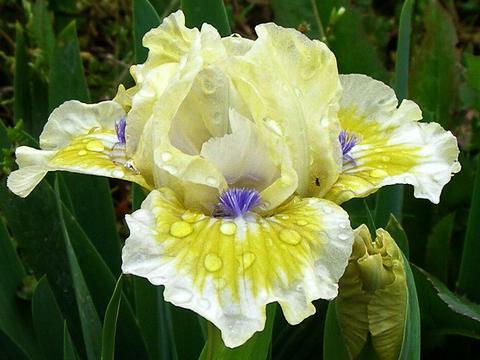 When I first saw this iris while visiting gardens, I liked its yellow tones; however, when it bloomed for me the next year with light violet lines and speckles on the falls, I did not know what to think. In a day, the lines and speckles disappear. 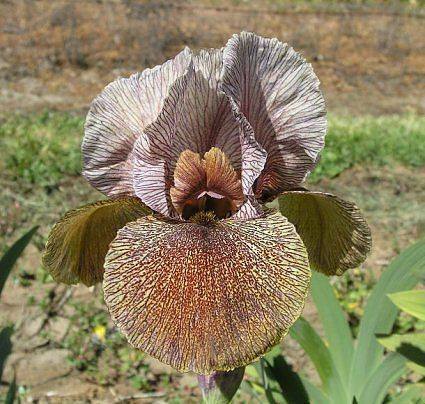 For anyone starting to hybridize, this has produced some very unusual seedling for Barry Blyth in Australia. Sun Chic (L. Painter, R. 2010). A bitone effect in this lemon yellow with darker falls; good growth and plants that are reliable for bloom each year. That’s All Folks (Maryott by Ghio, 2005). Standards are brilliant gold; falls white with gold blending to wide, muted gold band; beards gold. People I know in Texas assure me that when well grown, stalks of That’s All Folks can get as tall as five feet. But I must point out everything in Texas is bigger. This bright iris stands out in the early garden from afar and demands attention. You’re My Sunshine (Fan, 2010). I have yet to bloom this variety, but this gold self, except for a small white flash at the end of gold beards, has come highly recommended to me for wonderful growth habits, sturdy plants, and stalks that stand up under adverse conditions. I am looking forward to its bloom in 2018. 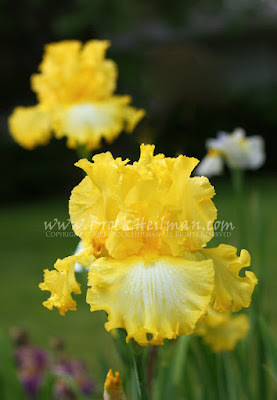 I hope that this blog has reminded you of the value of yellow to gold irises in your garden. 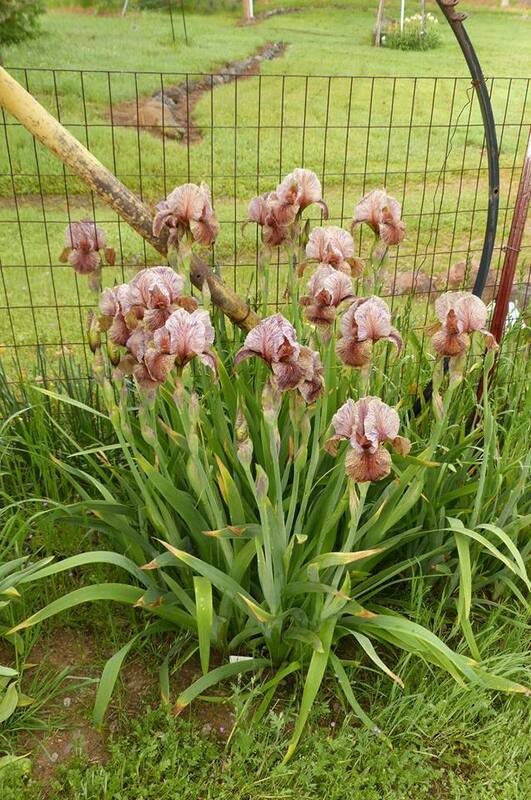 When it is time to add to your collection, bring some of these fine irises into your yard and you will be reward with a blaze of sunshine even on the coldest, wettest, and dreariest day by letting the sun shine in. 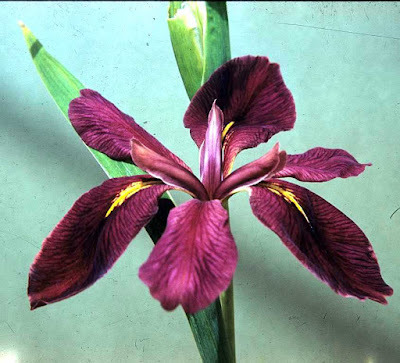 The American Iris Society is pleased to announce the 2017 Medalist for Intermediate Bearded Irises (IB), The Hans and Jacob Sass Medal: 'RED HOT CHILI' by hybridizer Michael Sutton. 'Red Hot Chili' Michael Sutton '08 IB 18" Early Mid-season bloom and rebloom. Standards yellow ground, heavily washed deep ruby red; style arms ruby red; falls bright yellow ground, rust red dotted edge; beards yellow; slight spicy fragrance. Sutton Iris '08, HM 2011, AM 2014, The Hans and Jacob Sass Medal 2017. 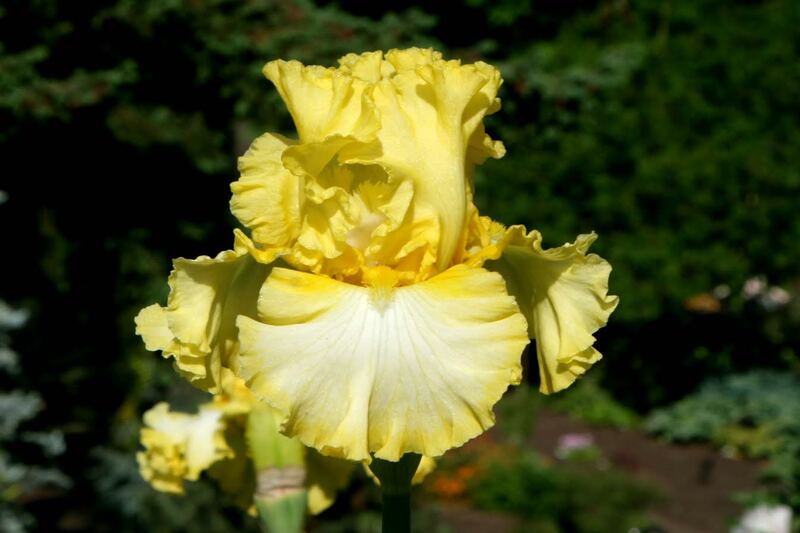 Beautifully formed, ruffled and lightly laced. Reblooming. Thank you, Mike, for another beautiful iris. 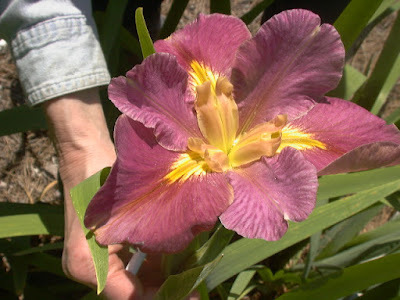 For a complete list of the American Iris Society 2017 Awards, go to http://wiki.irises.org/. 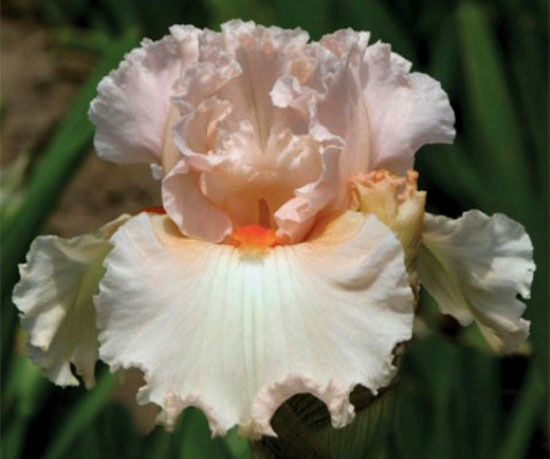 It is with great pleasure that we announce the American Iris Society's 2017 Border Bearded (BB) medalist: 'Ballerina Pink', by hybridizer Paul Black. 'Ballerina Pink' (Paul Black '10) BB 27" Mid-season late bloom. 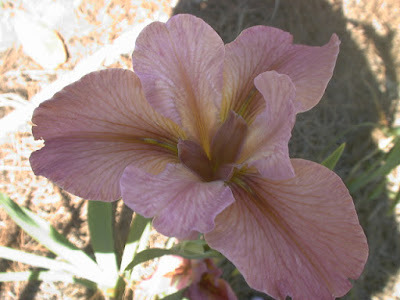 Standards pastel pink; slightly paler toward edges; style arms pale peach; falls creamy pink, ivory center, darker pink hafts and edges; beards tangerine; ruffled, laced, with slight sweet fragrance. Show stalks. 3 three branches, 8-10 buds. Strong grower. 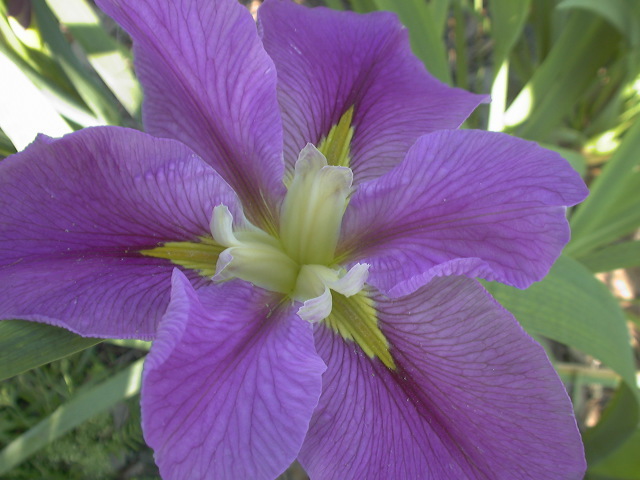 Introduced by Mid-America 2010. HM 2012, AM 2014, The Knowlton Medal 2017. Thank you, Paul, for an exceptional border bearded iris! 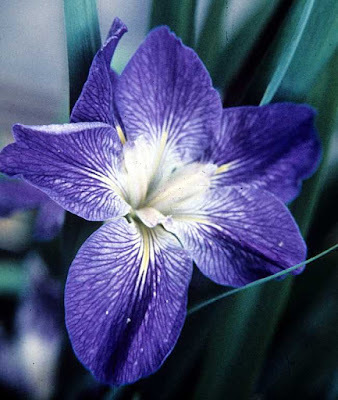 For a complete list of the American Iris Society's 2017 medalists, go to http://wiki.irises.org/. 'Reckless Abandon', from Keith Keppel; Paul Black's 'Beauty Becomes Her'; and 'Black Is Black' by Schreiner's. 'RECKLESS ABANDON' (Keith Keppel '09) TB 36" mid-season bloom. Standards center sulphur to citron yellow, changing to warm white texture veined yellow toward outer portion, narrow 1/8" dandelion edge; crests dandelion; falls burgundy black, large central area white to cream strongly veined burgundy black; beards solid deep chrome to cadmium yellow. 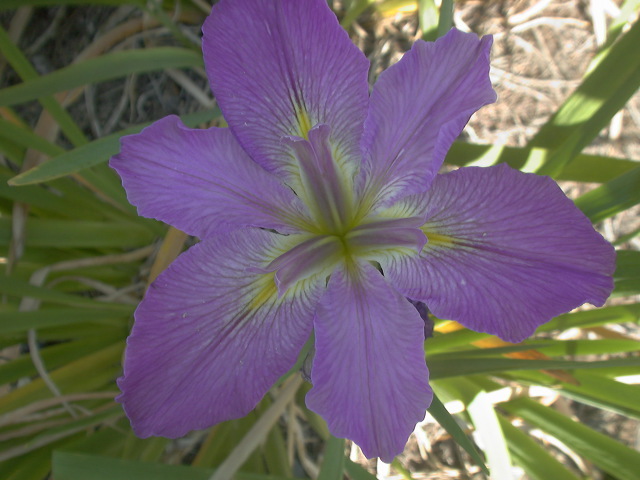 The hybridizer notes that the iris is a complicated composition that is decidedly different. It is ruffled and lightly laced. It has 3 branches and terminals carry up to 12 buds. HM 2012, AM 2014, The John C. Wister Medal 2017. 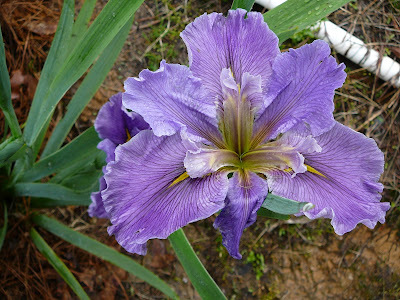 'BEAUTY BECOMES HER' (Paul Black '10) TB 42" Mid-Very Late bloom season. Standards and style arms medium dark yellow; falls pale yellow blending to medium yellow edge; beards medium yellow, light yellow at end; slight musky fragrance. Heavily ruffled and lightly laced. Strong, tall show stalks. Robust. The stunning beauty has classic form and style. HM 2012, AM 2014, Wister 2017. 'BLACK IS BLACK' (Schreiner '10) TB 37" Mid season bloom. Standards and falls black; beards black. 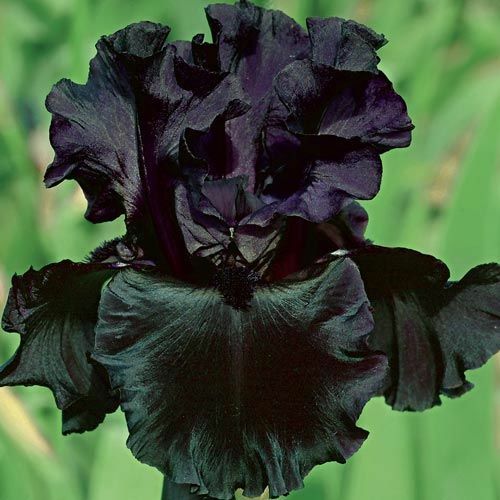 With ruffled, velvety onyx black petals and ebony beards, this black self has well-branched stems with triple-socketed buds, consistently yielding 9-12 buds. HM 2012, AM 2014, Wister 2017. 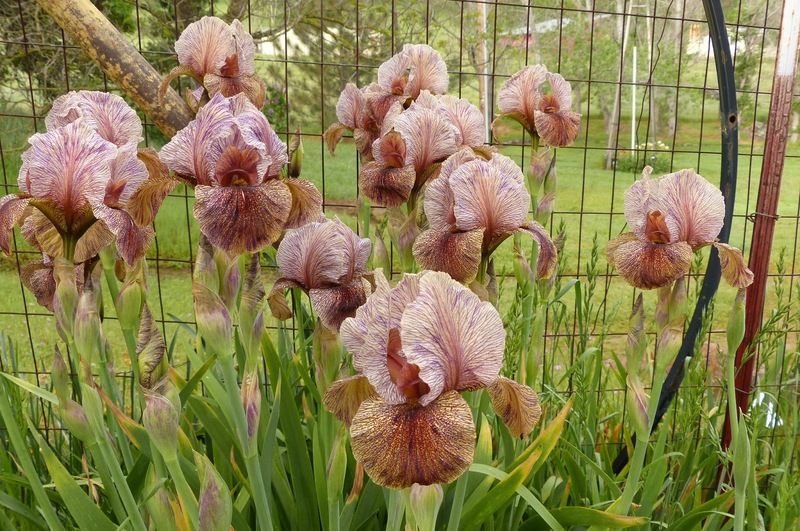 We congratulate each of these hybridizers and applaud their efforts on these superb irises. Louisiana has plenty of “bayous”. Dictionary.com defines bayou as “located chiefly in lower Mississippi Valley and Gulf States, a marshy arm, inlet, or outlet of a lake, river, etc., usually sluggish or stagnant.” It is pronounced bahy-oo. A list of Louisiana bayous and rivers can be found at Wikipedia, even an alphabetical list of bayous. There are, not surprisingly, 56 Louisiana irises registered with the name “bayou” as either the first name or the last name of the iris. Not surprising since there are so many bayous in Louisiana. I do not grow all the Louisiana irises named “bayou”, nor do I have pictures of all of them. 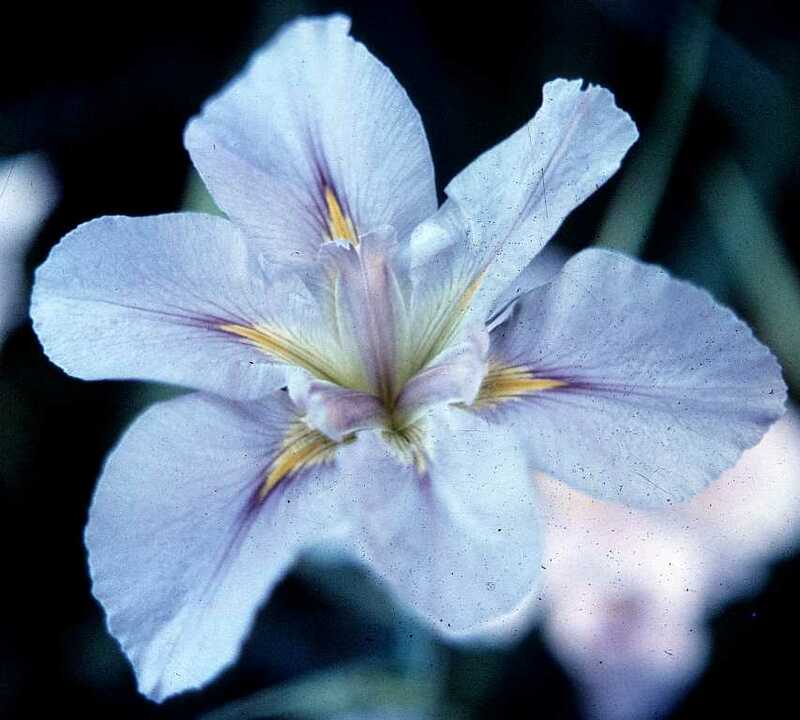 In fact, quite a few are missing their pictures in the Society for Louisiana Irises checklist. 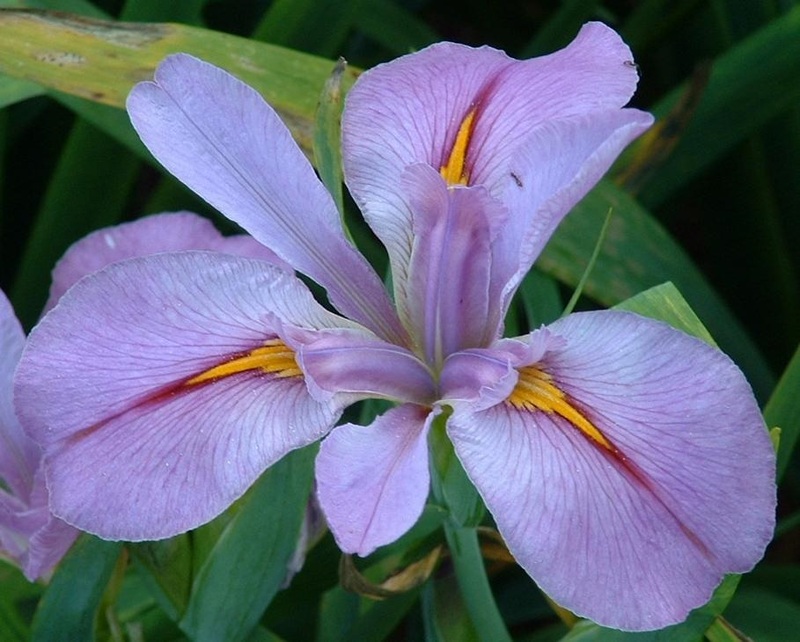 The checklist is published by SLI on a yearly basis and contains 2553 registered Louisiana irises and many pictures. However, I do grow quite a few and decided to show the diversity of Louisiana irises by concentrating only on irises with the name “bayou”. Although they share having “bayou” as part of their names, they are very different from each other in size, season, form and color. 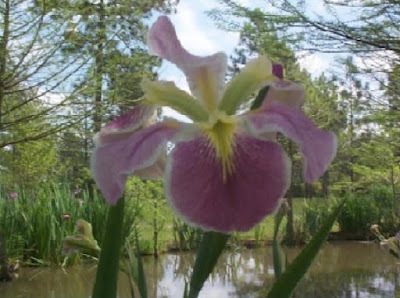 There are others with a last name of "bayou" but I do not have pictures of those irises. Now for those sharing the first name "bayou". 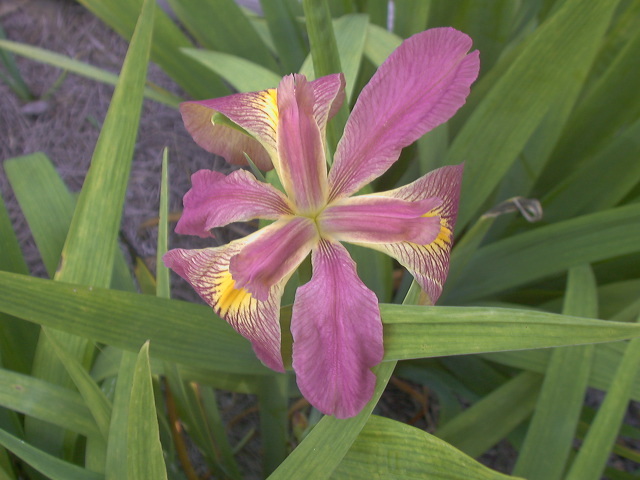 As you can see, Louisiana irises exhibit many different flower forms. The flowers as well as the plants come in many sizes. Plants can be from 12 inches to over 6 feet. 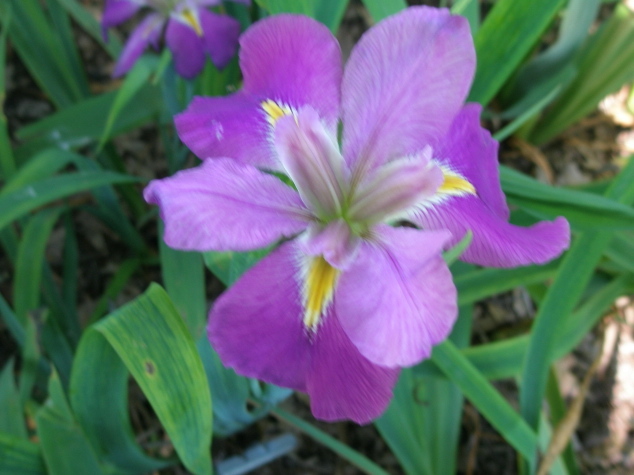 The flower can be very small or as large as a plate. I have added a picture below that shows a huge flower of a Louisiana iris but I do not have the name recorded. To learn more about other species of irises, visit the American Iris Society web site.